Zimbabwe's government says the UK can "go and hang"
HARARE, Zimbabwe (CNN) -- Officials at an African Union summit Tuesday adopted a resolution urging talks in Zimbabwe aimed at promoting peace and stability in the country, according to Egypt's official news agency. Robert Mugabe won re-election as Zimbabwean president in a controversial and disputed election. However some leaders, had harsh words for Mugabe in what appeared to be sharp exchanges in closed-door meetings at the summit in Sharm el-Sheikh. The Associated Press reported that Botswana's president said Robert Mugabe's government should not be recognized and that Zimbabwe should be barred from AU gatherings. Earlier Tuesday, Mugabe's spokesman said talk of Western intervention in the country's election crisis smacks of colonialism, and that the UK "can go and hang a thousand times." The comments came as it was revealed that opposition leader Morgan Tsvangirai has left the Netherlands Embassy in Harare, where he sought sanctuary a week ago. His Movement for Democratic Change party also denied Tuesday being in discussions to create a unity government. George Charamba, a spokesman for Zimbabwe President Robert Mugabe, told reporters at the African Union summit in Egypt: "The way out is a way defined by the Zimbabwean people, free from outside interference, and that is exactly what will resolve the matter. "For as long as there are some external interests that are seeking to express themselves within our own politics, then naturally we have that kind of resistance because for us it recalls a certain experience, ugly experience we have gone through before, that of colonialism." When asked specifically about Britain's influence in the election -- and criticism of the Mugabe government -- Charamba bristled. "They can go and hang," he said. "They can go and hang a thousand times, they have no basis, they have no claim on Zimbabwean politics at all and that is exactly the issue." Tsvangirai left the Dutch Embassy Monday morning and returned to his home in Harare, Rob Dekker, a Foreign Ministry spokesman, said Tuesday. The Foreign Ministry remains in contact with Tsvangirai and he can return if he deems it necessary, Dekker added. Tsvangirai arrived at the embassy on June 22, hours after he announced he was withdrawing from the presidential runoff against incumbent Mugabe. He cited political violence, intimidation and vote rigging as his reasons for withdrawing. Word of Tsvangirai's departure came as Business Day, a South African newspaper, reported that President Thabo Mbeki's envoys had secured commitments from Tsvangirai and Mugabe on a power-sharing deal. But the MDC promptly denied the report, which said Tsvangirai and Mugabe would work to implement a new constitution and other reforms. The newspaper did not name its sources, but Mbeki's spokesman, Mukoni Ratshitanga, told the paper that the envoys' visit to Harare was "a confidential briefing intended only for the president." An MDC statement firmly refuted the report, saying there were "no talks or discussions" between Tsvangirai and Mugabe. "And most importantly, there is no agreement in the offing," the statement said. "Nothing can be as malicious and as further from the truth." Ratshitanga later told CNN that the Mbeki-led mediation team has been in contact with both parties, but he would not confirm the Business Day report. The team has consistently maintained it will not discuss the process with the media, he said. "We hope that the challenges will be resolved," he said. "It would indeed be strange if the issues couldn't be resolved by negotiation." Leaders at this week's AU summit in the Egyptian resort of Sharm el-Sheikh have been slow to criticize Mugabe. The summit has been described by a U.N. official as "a moment of truth." 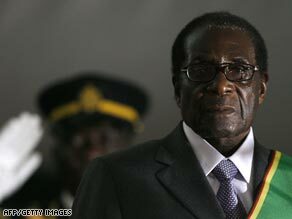 News agencies report that Mugabe was greeted warmly by some African leaders at meetings closed to the media. He arrived at the summit after Mugabe taking the oath of office Sunday, hours after election results showed he won Friday's vote. Tsvangirai's party has a team of five people at the summit, led by MDC Vice President Thokozani Khupe. "They are reporting very good progress. They have caucused with a lot of people," Tsvangirai said. African leaders are divided on how to deal with Zimbabwe. Some have been outspoken in their condemnation, with Kenyan Prime Minister Raila Odinga saying he does not want Mugabe recognized as the legitimate head of state. Kenya reached a power-sharing agreement this year after a disputed election ended in bloodshed. Others, like Mbeki -- appointed by the Southern African Development Community appointed Mbeki to mediate the political dispute -- have taken a softer approach, saying that a more conciliatory stance will allow for a settlement such as a coalition government. The U.N. and U.S. have loudly denounced the election, and a U.N. official said the situation in Zimbabwe imperils the entire region. "This is the single greatest challenge to regional stability in southern Africa, not only because of its terrible humanitarian and security consequences but also because of the dangerous political precedent it sets," U.N. Deputy Secretary-General Asha-Rose Migiro said. The U.S. and other nations are working on a draft resolution to present to the U.N. Security Council on Wednesday, the U.S. State Department has said. As the 53-member AU convened, the Elders -- a council of former world leaders led by former South African President Nelson Mandela -- urged the AU to "clearly state" that Zimbabwe's presidential runoff was illegitimate. "They occurred under the cloud of targeted political violence, precipitating the withdrawal of one of the two candidates," the Elders' statement said. "The African election observers left no doubt: The elections were neither free nor fair."